This is a desirable 6th floor unit at the Landmark Resort! 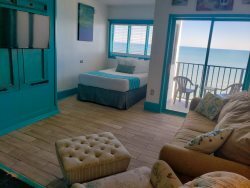 The studio is furnished with two double beds, full bath, a wet bar and a private balcony with ocean view. The wet bar area includes a sink, cabinet space, a microwave and a mini fridge! Located at the Landmark resort which is in close proximity to Myrtle Beach's most loved attractions, including Family Kingdom (.8 mi), The Boardwalk & Promenade (1 mi), Broadway at the Beach (4 mi) and only 2 miles from the Airport! The Landmark is known for it's many pool amenity options (see below)! This unit is located on the 2nd floor which is also known as the lobby area. If entering from the lobby, you will not need to take an elevator. Just go straight down the hall, and unit 221 is on the left.